Undertakes campaigns and other activities to inform people here and abroad about enforced or involuntary disappearances happening in the Philippines and the plight of the victims and their families. These campaigns hope to create public pressure which can minimize, if not stop altogether, abductions and enforced disappearances in the country and make it possible for the victims to get justice. Commemorates annually, through victims’ and advocates’ actions and statements, significant dates such as the International Week of the Disappeared in the first week of June, the International Day of the Disappeared on August 30 and the National Day of the Disappeared on November 2. Joins in the protest commemoration of the imposition of martial law on September 21 and participates in the week-long celebration of International Human Rights Day on December 10. Joins campaigns and activities being undertaken by other victims’ organizations such as the 3rd Saturday of the Month Gathering and visits to political prisoners. Joins fact-finding and humanitarian missions in connection with massive human rights violations in the regions. 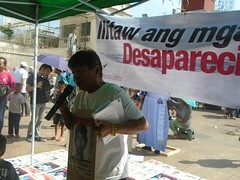 Demands a stop to government and military policies and programs that encourage enforced or involuntary disappearances. Conducts searches in camps, detachments, detention centers, prisons, burial sites and other possible places where the missing persons might be found. Helps in providing temporary sanctuary to families of victims and witnesses whose lives are currently at risk. Supports and assists families who are seeking legal remedies in court. Facilitates the holding of psycho-social therapy and counseling sessions when necessary. Solicit resources to help meet some of the needs of the members such as immediate finances after an abduction, scholarship or educational support for the orphaned children, medical assistance and livelihood/employment opportunities. Seeks out families of victims of enforced or involuntary disappearance and invites them to join the organization. Maintains its links with those who are not members. Holds gatherings, meetings and general assemblies of its members. Holds elections. Drafts And ratifies its Constitution and program of action. Provides reading materials such as statements, articles, magazines and others so the members and other victims/families can be updated of current social and political events. Organizes or co-sponsors forums and issue discussions. 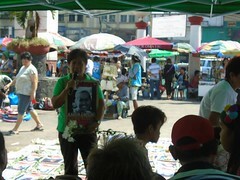 Links up with the appropriate agencies of the United Nations, the UN Special Rapporteurs and Representatives and with international human rights and church organizations to: inform them of the state of enforced disappearances and other human rights violations in the Philippines; submit and follow-up cases; make oral intervention in selected meetings; and other activities to seek their support in putting a stop to enforced disappearances and other HR violations. 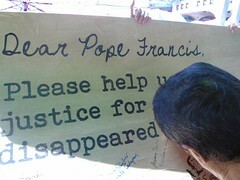 Works with other organizations abroad working on enforced disappearances and other HR violations (e.g. Las Madres de Plaza de Mayo).